James Paul Marsden was born in Stillwater, Oklahoma. 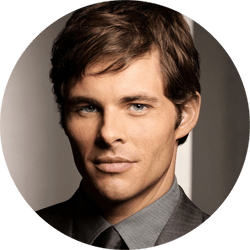 He got his first roles on a series of television shows including The Nanny, Party of Five, and Ally McBeal. Marsden was cast as Cyclops in the X-Men films and Lois Lane’s fiance in Superman Returns (2006). He also starred in the romantic drama The Notebook (2004) and the romantic animated comedy Enchanted (2007). Marsden also starred in the film adaptation of the Broadway musical Hairspray (2007) in which he sang two hit songs. The soundtrack later went platinum.